THE FOLLOWING ENDORSEMENTS AND COMMENTS ARE FROM PROFESSIONAL PEOPLE WHO CHOSE TO PARTICIPATE AND REPRESENT THEIR INDUSTRIES IN THIS FORUM. THE COMMENTS ARE MESSAGES OF ENCOURAGEMENT AND THEY SHALL NOT BE INTERPRETED AS REFERENCES TO ANY PARTICULAR PARTY, GROUP, AND OR ERA. Please click on the image to enlarge and view the comment. "It is so wonderful to see the Persian community come together to honor and acknowledge the artist, because we have had and have some truly extraordinary talented artists. It is very empowering and encouraging to see the achievements of my peers." "I'm happy that an award ceremony exists to recognize some of the best international talent from the Iranian community. In a time when Iranians and Middle Easterners are not shown favorably in the world media, it is important for the community to stand up and show ourselves in a positive light. The Golden Lioness achieves this and it gives me joy to see them recognize two of our best, Omid Djalili and Shohreh Aghdashloo." "The Persian Golden Lioness Award is an honorable recognition by a community that I proudly represent as an actor. It is inspiring to see well deserved artists being awarded for their outstanding work." "It is so very refreshing that organizations such as yours (Persian Golden Lioness Awards) exist and that so many Iranians are distinguishing themselves internationally today. I believe that we all have a great responsibility to bring forth to the world the 'Other Side', past and present, of the Iranian people and of the Iranian nation to the world. We must do this for today and for tomorrow." "With a culture obsessed with having their children raised as doctors, lawyers and engineers, it is great to finally see an awards ceremony set up to recognize the incredible artistic talent that Iranians are sharing with the rest of the world. I am sure this will inspire the generation of youth ahead to entertain the thought of careers in music, film ,literature and the fine arts." "We are so grateful there is an occasion that highlights and honors the brilliance of Iranian cinema, and the incredibly talented Persian artists. The poetry and magic of Iranian Cinema is able to transcend multitudes of barriers, and define the beauty of humanity. If ever there was a time for these kind of films, it would be now." "The work of diaspora writers, artists and actors has done much to present a positive image of Iran and its culture in the eyes of the West. The work of these diaspora artists is a testament to their ingenuity, creativity, and talent. It's wonderful that the Persian Golden Lioness Awards have been created to acknowledge this work and to recognize the beauty and uniqueness of this art and these artists." "I am sincerely proud of the talented Iranian artists recognized by The Persian Golden Lioness Award. Through their amazing work they classify beauty and grace, and this is just the beginning of celebration for their hard work and success. Such artists bring inspiration, hope, and courage to the Persian community." "As a first time author and as an Iranian living abroad with genuine interest in the Persian arts, I am delighted to know that organizations such as The World Academy of Arts, Literature and Media exist to celebrate the artists who continue to contribute to our heritage. The Persian Golden Lioness Award is a brilliant way to salute Iranian artists worldwide." and history background from my mother. I think that it is important to live the SPIRIT of a country, the mentality, the soul - no matter where you are home is in our hearts- and that's the place where we all have to meet, it's our emotions that unite and reunite not only artists but all human beeings. Thank you for your strength, your believe and keep on! Best wishes"
"I'm happy to see that the Persian Golden Lioness Award has made it to it's 2'nd year. I hope a lot more will follow. These Days it's even more important to keep an award like this alive. My warm regards to everyone who was, is and will be a part of this." "The art and culture of Persia has been a bridge between the East and the West. Let it be so again with the 2nd Annual Persian Golden Lioness Awards. To honor Vanessa Redgrave with this award is doubly appropriate- she is a lioness, in her devotion both to the mastery of her craft and to the courage of her convictions." "The Persian Golden Lioness Awards shines a bright light on Persian Artists around the world. We can find Persians in almost every field that others can look at and respect. I'm proud that we can unite as Persians and Persian-Americans focused on one goal- with one voice for artists of different fields and culture. Finally there is a system within the Persian community that acknowledges artists hard work and respectability." "Honoring our artists is long past due. Hopefully the Persian Golden Lioness Awards inspires our work personally and our voices are heard globally. Congratulations to Shohreh for all her achievements. Congratulations to all the artists who have chosen this path." "The Persian Golden Lioness Awards and the people involved in its inception and continuity in this Second Year have achieved to unite the best of two worlds: That of East and West. As a cosmopolitan actor of Persian and Swedish Roots and working Worldwide including in the US, it is comforting to see an Award that acknowledges the talents of yesterday and today." "The Persian Golden Lioness Awards is a true encouragement and boost for our community and also for putting us in touch with the cultures of our host countries. Hungary is a beautiful and highly cultured country and to see one of my collegues Shahrok Moshkin Ghalam honored in category of Dramatic Arts makes me very happy and proud. We are currently touring the US and Canada with a common play Kafaneh Siah and we are proud to be the Ambassadors of WAALM in both Europe and North America and look forward to seeing you all in Budapest this October." 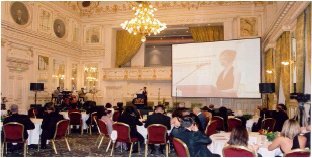 "Congratulations to all at The Persian Golden Lioness awards on year two, and for recognising the talents of those in all the arts, who with their hard work and skills, have the power to illuminate the beauty and importance of the rich Persian history and culture, its architecture, literature, music, performance and art to our youth and the rest of the world." "Thank you for taking the initiative to create an award ceremony honoring the talented individuals in our community. It's time for us Persians to showcase our talent on the world stage. I look forward to your success." The fame of your virtuous deeds Like my love have reached a peak Joy is what everyone needs Neither can fade, nor are weak." "The Persian Golden Lioness Award presents the strength and vitality of the Iranian community in areas not traditionally celebrated or taken seriously. As a female artist and activist, I am particularly proud to see that this year's awards go to two amazing women (Mrs. Azar Nafisi, Mrs. Shohreh Aghdashloo) whose artistic work has introduced the cultural side of Iran to the rest of the world." "No matter how far my journey takes me, Iran is always with me, in my heart and soul. Thank you, Persian Golden Lioness Awards, for shining the spotlight on these gifted and hard-working artists so the world can see the beauty that Iran has to offer. Congratulations to all of you!" "The Persian Golden Lioness Award is indeed an honorable effort to recognize the worthy endeavors of the Persian women in the fields of literature, arts, music and film industry. The very well - chosen personalities of this year's award would be, by all means, the testimony to the future success of this organization." "The creation of the Persian Golden Lioness Awards for honouring achievements of Iranian artists and writers is a source of joy for all the lovers of the Persian culture. Cheers to those who initiated this award." "The Iranian Diaspora represents one of the most talented, most accomplished communities in the world. The Persian Golden Lioness Awards is a timely reminder of the continuing contribution of Iranians in the field of art, literature, and the media." "In a world increasingly devastated by war, religious extremism and greed, The World Academy of Arts, Literature and Media is a beacon of light shining upon the very people who hold the promise of relief for our ailing world. Indeed, the arts may be humanity�s last hope for creating empathy�that is, understanding without necessarily agreeing. It is only through empathy that we as a people can hope to live in peace. The Persian Golden Lioness Awards honor Iranian artists at the forefront of their craft�artists making a difference in a world that is in dire need of awakening to understanding and ultimately, empathy." "These awards represent the best of Persian culture. They bring people together at a time when so many forces conspire to pull us apart. Through the celebration of creative passion, talent and commitment to quality, we can grow lasting bonds that will transform the world." "It is wonderful that the Persian Golden Lioness is celebrating and honoring the exemplary talents who have put 'Iranian' in a positive light and dedicated themselves to the interests of Iran and Iranians irrespective of their professions, religious beliefs, ethnic affiliations, and political orientations. These accomplished Iranians, whether in the arts, literature, journalism, or science, have distinguished themselves against all kinds of odds in not-so-friendly foreign environments. Let's hope that their recognition inspires a new generation of Iranians abroad to work harder for pride and prosperity of their ancestral land." "What a great thing, The Persian Golden Lioness Awards. To recognize the the eclectic talent which stems from the Persian community as well as the Middle East is something I am very excited and inspired about. In the unfortunate political climate we live in today, we must take the opportunity to encourage and showcase, Persian talents, internationally." "It is so enlightening to witness such efforts as, 'The Golden Lioness Awards' acknowledging the achievements of Iranians in all walks of life. As a media journalist I hope we realize the importance of the media to enhance such activities. We must encourage a respectable, efficient Iranian television network in this country and support those who can make a difference for letting our voices to be heard." "Persian culture is still a mixture of different influences and currents and this is worth to assist and make it better known all over the world. Golden Lioness Awards are an important contribution, to support this target. Because of these Awards, Artist, who initiate for Persian culture, will find the attention, they deserve. For me and probably many other Persians, Persian culture is part of my home, I carry in my heart." "In this turbulent time for Iran's art in which the memory of the past artists and freedom of the young artists is constantly oppressed in the hands of the rulers in our homeland, it is heartening that The World Academy of Arts, Literature, and Media is working hard to keep the memories of the pioneer artists and founders of Iranian theater, film, and television alive while providing support and hope for the young Iranian artists today. I wish for WAALM's continued success and hope that Iranian art continues to grow and develop among its Diaspora." "I am delighted to hear of an organization that is formally recognizing the art of the Iranian diaspora. We have such a rich history, and have always been a civilization that has excelled in the arts---Thanks to the Persian Golden Lioness Awards for reminding us of those who are carrying on the torch. Congratulations to all the honorees, and especially to my friend Shahrokh!" "At this time that the culture of misery and bleak hopelessness is damaging our beloved motherland's image all over the world, celebrating the beauties of our culture and the amazing talent and achievement of our people is indeed so wonderful and a soothing breath of fresh air. I congratulate you on this great effort which recognizes the hard won achievements of our exceptionally talented and gifted people as well as exposing the positive side of our rich heritage in literature, music, and art to the world. Best wishes and thank you." "Golden Lioness? What a nice name for this academy awards. Specially for us, women whose gender has been always considered as a multiple crime despite of our creativity and insights into the world's culture and more importantly our beloved country Iran - the land where civilization expanded and first human rights were born. My best wishes to the founders of this cultural organisation and in the hope that such organisations get established more in this world with no culture." "The only International language is Arts, and I am very proud to see so many talented Iranian Artists all around the world. It is an honour for me to see you have started The Persian Golden Lioness Awards. it keeps Iranian Artists live forever." "It is very interesting that the Iranians around the world try hard to show themselves as normal human beings! In these days I am wonder how we can show that there is no diference between the people of the Middle East and the people from other parts of the world. I think your work on supporting the Iranian artists is one of the best ways of showing our dignity and our rich culture." "It makes me proud to see Iranians being more successful in Showbusiness and with support of the Persian Golden Lioness Awards Organization we can all shine more together and represent Global." "In a time were in politics the East is shifting away from the West and the dialogue has halted because of a lack of common understanding. It is the art which is the bridge between the cultures and remind people on the basic needs and rights. Hence I say thank you to this organization which supports and encourages artists to pursue their stony way to bring their message across. And so help to plant the seed of a common understanding." "I am very glad and proud to hear about the Persian Golden Lioness Awards.This award is a great opportunity to establish and support a community of Persian Artists worldwide. It's also a motivation and inspiration especially for the younger and gifted artists. I'm looking forward to the next years." "On this beautiful occasion of the Second Annual Persian Golden Lionness Awards, my warmest congratulations to the esteemed awardees and all my appreciation for their light and talent. Also my great thanks to all involved in organizing this event for honoring the arts at this brilliant level and at this crucial time. May the dreams we dream for ourselves and carry forth in our art be wonderful candles that guide us at all times, in the lightness and in the dark." "An artist's life can be extremely lonely and frustrating, and so any kind of encouragement is of great value. I think awards are silly, but I support any organization whose goal is to promote artists & writers, and encourage among them a much-needed sense of community." "I salute you for recognizing the power that art and literature have in shaping a better tomorrow. Thank you, WAALM, for providing Persian artists with a collective voice. Together we will unite cultures and precipitate change." "As a Canadian/Persian Artist...I draw on my culture and heritage for every role I approach...being Iranian has made me the artist I am today...As Stanislavsky would say the person you are is a thousand times more interesting that the best actor you could ever hope to be...I am proud to see the Persian community come together to celebrate and honor our culture at a time when the world seems to frown upon us...perhaps it is time we showed them how truly gifted we are." "It is my hope that this award, and the changing times it hails, will raise awareness within our community and provide more opportunities for future generations of Persian artists." "Kudos to the Persian Golden Lioness Awards and the gifted Persian artists to whom they pay homage!" "My Salutations to WAALM for celebrating the power of art and uniting the Iranian artists.My warm congradulations and heartfelt appreciation to the highly talented awardees.May we all be successful in presenting our rich Persian culture and promoting the beauty of life, peace, freedom and human values through the medium of our artistry." "For so many years Iranian filmmakers have been producing films that have won the most prestigious award at festivals in the world including Cannes...I am so happy as an Iranian actor to see films represent what's best about our people and culture; love for the humanity in people and the ability for people to transcend culture and race and share what is dignified in the human spirit for all peoples of the world..that is why I am so proud of Iranian film making and I am so proud that the Persian Golden Lioness Awards acknowledges what's best in our culture." "As a film Veteran who has taken part as crew on some of the most important Persian co-productions with Western film companies it is heartwarming that thanks to the endeavors of WAALM's Founders and Staff, the Persian Golden Lioness Awards acknowledges once again our cosmopolitan Persian Talents of Today who are now carrying the Flame of Persian Culture and Arts and share it on an international level . All the Best to the Awardees and particularly my friend Mrs. Shohreh Aghdashloo." "Artistic expression is about dedication, commitment and freedom. The Persian Golden Lioness Awards puts the spot light on those who dedicated their lives, desperately looking for the beauty and often lost in the dark. That's celebration of life and shines upon our rich culture. Congratulations and thank you for your devotion." "I am happy there is an awards ceremony that celebrates the diversity and divergent interests of the Iranian community. We are a diaspora that continues to contribute to the worldwide community, and that should always be celebrated." "My warmest regards to The Persian Golden Lioness Awards. We find ourselves at a very sad moment in human history, with many harsh words being spoken. Reminding the world of the important international role played by Persian artists for centuries, as well as today, is an important and needed undertaking." "It's been a long road...but now, we are united in our diaspora. I am delighted to learn of the initiative of the Persian Golden Lioness Awards to recognize the efforts of the Persian Artist. May the road ahead be less challenging!" "Thank you to let 'Persian Golden Lioness award' happen, I think supporting the arts is supporting the identity and in this case the 'Persian identity'." "I would like to thank the 'The Persian Golden Lioness' awards for actively recognizing and honoring Persian artists and musicians some whom have no other hope of being recognized for the amazing work of art they create in this world. Bringing people together to celebrate & appreciate culture, life and art is a noble endeavor which bridges differences and unites people of different beliefs and backgrounds in celebration of their history, identity and culture. May the Persian Golden Lioness award continue to shed light on the magnificence & beauty of Persian works of art & their creators." "As a non-Iranian poet who has been given the privilege of retranslating some of the greatest works of classical Persian literature, I am honored and humbled to have been asked to endorse the Persian Golden Lioness Awards. In a world increasingly divided along sectarian lines, it is more important than ever that we acknowledge and celebrate the central role the arts can play in forging a human community. The Persian Golden Lioness Awards is such a celebration and, as such, is one building block of that community." "Cultures survive through the arts. Iranian culture is no exception - as even Alexander 'The Great' did not succeed to burn the Glory of the Arts and Sciences of Ancient Iran off the memory of History. It is my greatest pleasure to see 'the Pesian Golden Award Program' recognize and support the talented artists of our country throughout the World." "Although the delicate roots of many expatriate Iranians, who either migrated by choice or by compulsion, desiccated as a result of the pain and sorrow of enduring the distance from their beloved homeland, quite a plenty of prodigies among them who managed to take root in their adopted host countries have precociously blossomed. I am delighted to see that the fragrance of these blossoming geniuses-in-exile is being spread across the globe by The World Academy of Arts, Literature and Media." "It is wonderful to finally have a venue to acknowledge the Iranian Talents/Artists internationally. After all Iran has been one of the oldest civilizations with fascinating culture and history. Let us celebrate the true nature of this civilization and cheer for her talented Artists." "I am very glad to see you and some other intelligent souls providing and creating new paths for Iranians internationally. It is about time for all Iranian artists to get to know one another and cherish each others achievement no matter how Big or Small. We should share and shape love for Iranian art and Iranian artists. I hope you reach your glistening goals." "I am so elated to see the remarkable accomplishments our fellow Persians are offering this world. With the Golden Lioness Award as a tool to recognize the gifted Persian's that ARE around us everyday, our culture and people will shine, shine, shine!!!! We are too beautiful and diverse a community not to be recognized!" divisions, all of this has unfortunately been pushed into the background. That is why today promoting the cultural values and importance of Iran is a crucial task, also for the purposes of dialogue between peoples. In this context the WAALM plays a key role by highlighting and awarding prizes to leading Iranian cultural figures." "By having this award program, the world comes to recognize and appreciate the artists who dedicate their time and talent in the hope of making a difference in the lives of others. From this event, communities can learn about artists who associate themselves and their art with Iran and Iranian culture." "As an Irish/Iranian born in Ahvaz raised in England by an Iranian mother and an Irish father - I have embraced and meet many cultures but never have I faced such a warm and friendly and loving culture as the Persians - who are always giving - wether it be advice, love, friendship, bowls of rice and ghormeh sabzi - its enchanting to hear something postive being given back to the persian community in the form of The Persian Golden Lioness Awards! Where ever I am in the world - like for instance at the airport, I'll always use my Irish passport but when ever meeting strangers I always use my Persian heart!" "As an Iranian I am thrilled that finally there is a forum where artists can be recognized for their great works and contributions....this will bring on the so many necessary changes that are long over due in our community...finally, we are moving on!" "To be Persian, to come from a land so steeped in beauty and passion brings with it a duality that can often be elusive. Defining and celebrating some of our greatest contributions to the world of arts can only help in illuminating our spirit as a people, in turn perpetuating our stories, which need to be told, need to be heard. Here's to the Persian Golden Lioness Awards for shining that light!" "As a young Iranian pursuing a career as a classical musician, I have always made it a goal to share my passion and knowledge of my art form with the Iranian community. I commend the Persian Golden Lioness Awards for recognizing the outstanding Iranians who have excelled and made an impact in the arts internationally and within our own community. It is because of these beacons that I too was influenced to pursue my dreams. I hope that I will too have the same influence on the generations of Iranians to come." "We must never doubt that the arts are essential to education, expression of thoughts, human progress, communication, freedom, creativity, imagination, and engagement in life. I would like to take this opportunity to commend the organizers of the Annual Persian Golden Lioness Awards for providing a global platform for recognizing the contributions of dedicated Iranian artists and authors toward enhancing and enriching the Persian culture and, indeed, the world." "With all of the negative press about Iran in the media lately, it's wonderful to have such an award that realizes the artistic contributions of our talented community." "I still live with the memory of colours of Iran and I try to preserve them in my works. I like to congratulate you for gathering all these people in this page,that remind me of the colours that I have missed so much." "Persians have been making remarkable contributions to the arts and sciences since the dawn of civilization! I am proud to support the Persian Golden Lioness Awards." "As a second generation Iranian-American living here in the U.S., I am so very happy that an event like the Persian Golden Lioness Awards exists which allows us to recognize all of the talented Iranian artists representing our culture. The arts are a very vital part of our lives... and at times I feel we overlook the importance of it. With organizations like this, we are able to honor talented individuals which in turn inspires the younger generation to follow their dreams and pursue their passions in this field." "It is written that music can tame the savage beast. Well, the arts have the power to change a troubled world, as they are not mere words written on paper, images caught on film, a canvas, or strummed on strings. They are expressions brought to life by the hearts and minds of amazing individuals who speak a language which transcends definition...one universal to all. Those involved with the Persian Golden Lioness Awards not only recognize this, they celebrate it." Ren A. Hakim, Author "Xerxes"
"Life without love and arts is a life not-worth-living. I am so glad that there exist organizations like the Persian Golden Lioness Award which honor and appreciate artists and their works. This can bring the level of appreciations of arts to the same level as other more respected professions in Persian community have." "Film has the power not just to entertain but to educate, and, in recent years, we have seen a surging trend in this very direction. Few subjects are as vital to today's viewing public as a sound an accurate rendering of the Iranian story. That is why it is so refreshing to see an organization like The Persian Golden Lioness Awards finally recognize the Iranian storyteller." of "In Search Of Cyrus The Great"